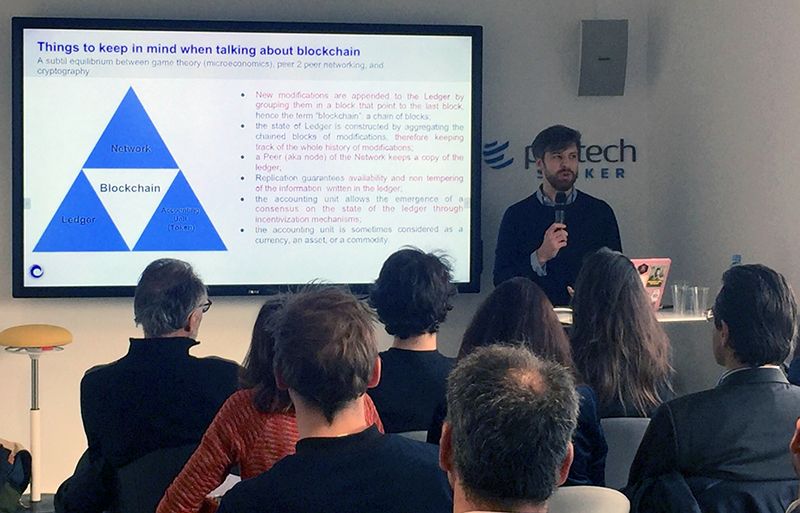 The Partech Shaker hosted ConsenSys France for a talk on blockchain and how it can be of value to entrepreneurs. Jérôme de Tychey, Blockchain Tech Lead at ConsenSys & President of the Asseth Association, explained what blockchain technology really is and how it works, while Matthieu de Saint Olive outlined blockchain use cases. To finish, Guillaume Dechaux focused on Komgo, a blockchain-based platform for commodity trade finance. You may not know what blockchain is exactly, but you have all heard of Bitcoin. Blockchain is the technology behind Bitcoin. Blockchain technology is built on 3 intertwined pillars: the accounting unit (token), the ledger and the network: the token incentivizes peers to reach consensus as they value the unit; the ledger tracks the whole history of modifications, and if you don’t have a network, you can use an excel sheet. New modifications are appended to the Ledger by grouping them in a block that points to the previous block. The state of Ledger is constructed by aggregating the chained modification blocks, thereby keeping track of the entire modification history. A network peer (node) keeps a copy of the ledger. Replication guarantees availability and non-tampering of the information written in the ledger. Through an incentivization mechanism, the accounting unit enables the emergence of a consensus on the state of the ledger. - Incentivization: brings consensus to many nodes and guarantees network resilience. - the Merkle tree structure (hashing transactions, hash of hash) allowing efficient and secure verification of content in a large body of data. Blocks of transactions point to one another thus forming a chain. Sharing a file with up to 4 or 5 friends or colleagues is easily manageable, but for a group of 30 people, it becomes difficult to find the latest version. This is when blockchain is useful. At ConsensYs, the main technology we use is Ethereum. The idea is the following: as we have a ledger and a ledger can be seen as an IT memory, we can build a computer upon it. In other words, we use the blockchain to manage the PC memory and ultimately, to create a worldwide computer. This leads to the notion of Smart contracts, which are neither smart, nor contracts, but immutable tamper-proof self-executing software programs. They are code-stored on the blockchain and self-executed using the trust and security of the blockchain network. They enable an application to be created on top of the Ethereum blockchain. Ethereum is a blockchain, relying on 3 pillars: network of nodes, replicating the same ledger and accounting with an accounting unit (ether). What is so special about Ethereum? Transactions can contain code and the nodes host a virtual machine called the EVM. EVM enables you to pay as you go and stops when you have run out of funds. Ethereum has the largest developer community with around 450,000 developers. Blockchain is coming to mobile phones: the latest Samsung S10 features a storage capability for private keys for blockchain systems and integrates a cryptocurrency wallet. Tokenized financial assets will solve pain points for issuers and investors. - rebalanced assets: issuers can continue to count on stable funds while investors can achieve their rebalancing goals by trading assets with each other. => When does it make sense to use blockchain technology? The Internet is an efficient network for the exchange and storing of information worldwide, but data is not unique on the web and can be replicated many times. While Internet is the web of information, Blockchain is the web of value: it facilitates the transfer of value and property within a network. The transfer of any digital object between two users is recorded in the shared ledger, making it impossible for that digital object to be transferred twice. The great interest of Blockchain is that it allows trustless exchange of digital assets. 1- Do I really need a blockchain? Blockchain is designed to share unalterable facts within an ecosystem: projects using blockchain with only one node (one single player holding the ledger) don’t require blockchain technology and can use a database, which is more efficient for information storage than the blockchain. The aim of Blockchain is to move trust. Today, to trust a digital system, you rely on a trusted third party who keeps a centralized ledger and manages all the transactions sent by its players. This requires some reconciliations. With blockchain, the ledger is held by all the participants in real-time and no reconciliation is required. 2- What do I put on-chain or off-chain? Data storage cannot go on-chain, but you should put on-chain proofs of authenticity of the data, which will be treated off-line. It is better to do your calculations off-chain, otherwise all blockchain participants will have to execute your calculations as well. Most blockchain use cases have both on-chain and off-chain processes. When you start doing business with a client, you will need to check some information about him. In this case, the user and access management, as well as the tracking of its KYC (Know Your Customer) must be achieved on-chain, to bring immutability, decentralization and transparency advantages. On the other hand, all data processing and storing is done off-chain. 3- What is my level of permission? Blockchains can be public or private and there are different levels of permission (possibility to write and validate transactions into the ledger). In a Public blockchain, anyone can run a node and anyone can read the shared ledger and verify its integrity. In a private network, only authorised actors can access the network and run nodes: the shared ledger data can be read by authorized actors only. => In a permissionless network, each person with access to the network has the same rights and permissions. In a permissioned network, only authorised actors can run validating nodes. - In a public and permissioned blockchain, only verified participants can propose new blocks (EOS, Ethereum Quorum…). - Smart, self-executing contracts and assets: less developed use cases. - Self-sovereign personal data and KYC: provide the user with individual control and security of personal data. - Transparent accounting, reporting and analytics. => Blockchain adoption: where are we today? Blockchain is a relatively recent technology and there is a lot of talk about it: Bitcoin appeared 10 years ago and Ethereum 4 years ago. 2018 was the year blockchain validated itself through many different use cases and completed its POC phase. 2018 was still a test phase. We are convinced that many projects will come into production in 2019. The current phase of this multi-decade cycle will result in everyday users interacting and transacting with blockchain on a daily basis. Mass adoption and usability are the next phases. Komgo is a platform regrouping banks and raw material companies created in 2016 to digitalize the financing of commodities trading. This private blockchain network has 15 members, including financial partners such as ABN Amro, BNP Paribas, Société Générale, ING… and commodity groups such as Shell, Kloch Supply & Trading… Komgo enables seamless data communication between commodity trade institutions, corporations, inspection companies and third parties. The trade finance sector hasn’t evolved for many centuries. The whole process is still long, expensive, not secure and very risky. Komgo was created to provide more security and efficiency to the world’s commodity trade network. Komgo facilitates KYC by easing the verification of the client’s identity without going through a centralised database. Document exchange with blockchain will be encrypted only between authorized users. Komgo is a real time platform with all the benefits of blockchain. Records of transactions are only available on a need-to-know basis according to the choice of the participants. Don't miss any of the Partech Shaker's events! Join our Meetup group.